The appeal of most news stories is that somehow it all has something to do with us. The DSK affair involves all of us in France because he is – well – French. Opinion polls here today suggest that at least half the population think he should return to national politics. None of this serious reflection is of interest to Gilles. He has already spent the morning in Lycra on his bike and soon the live TV coverage of la Grande Boucle will start. Now, I’m not sure whether or not to raise issues of waxing and shaving – perhaps I’ll come back to it when I discuss supermarket armpit issues. However, a most serious matter has arisen as a result of the DSK affair. Many Anglo media outlets have suggested that as a man of 62, DSK would not have the sexual drive to chase females. Now, Gilles has taken this matter very much to heart and has asked me to rebut any suggestion that the Euro male in his 60s is not up for it. So, world take note. The old boulangers of France are still baking the best hot baguettes. They do tend to get up early but in my experience this is often the case wherever you are. News that Facebook has had a slight fall in users has left me wondering if we need to recreate some of the old fashioned social networks. In France some of these have never gone away. The cafe, the street market and the long aisle blocking supermarket chat still rival cyberspace. In the Boulangerie this morning the young assistant spent two or three minutes talking to an old guy about his daughter’s dog. Husbands, wives and children in the same house do not send one another e-mails. Sadly the old town and village lavoirs have fallen out of use. These were areas of a river or stream partitioned to allow the communal washing of laundry and of course the exchange of News, blues and views. 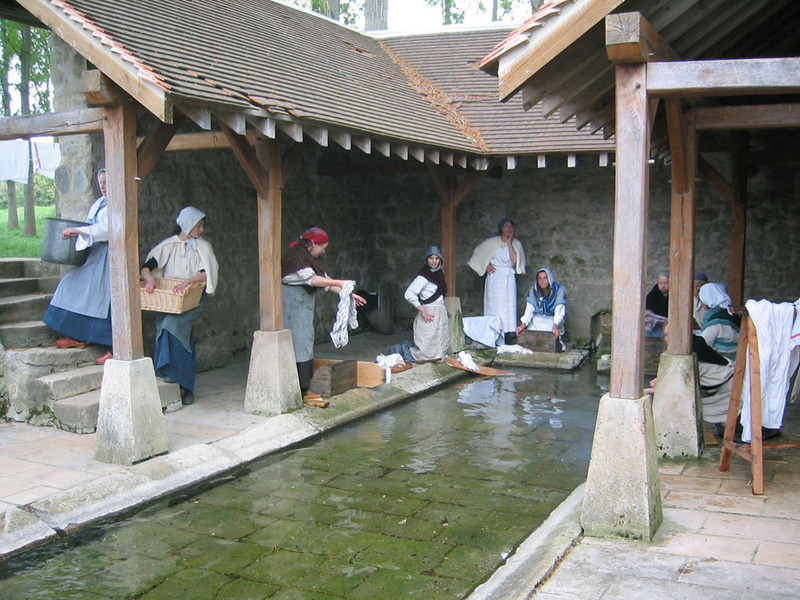 Whenever I come across an old lavoir I feel like writing a story where young Primrose Fodderfurrow (Marguerite Vachemouton) (Foundling orphan and probably a misplaced aristocrat) takes her mum’s table linen down to the river and learns that there’s to be a party at the big house (Château). Sounds like a winner to me. Anyone wanna suggest a title? Tell you what – a free copy for the winner! Emma thinx: Know what you don’t know. Know who you do know. This entry was posted in Cycling, Emma Calin, Music, Philosophy, Social Comment by emmacalin. Bookmark the permalink.